Arrive in Kiev, capital of Ukraine, and transfer to your ship. * After boarding, take free time to relax before dinner, or join our “welcome walk” to stretch your legs and start getting oriented. 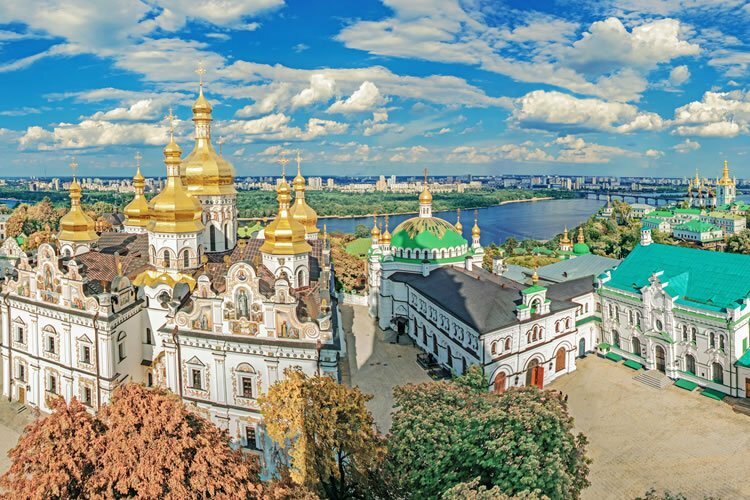 Tour Kiev, one of Europe’s oldest cities, with a heritage of Viking, Cossack and Ukrainian peoples. See its historic buildings and monuments, and take a guided tour of the lovely St. Sophia Cathedral, a UNESCO World Heritage Site crowned with 13 glimmering domes. Afterward, continue to the Monastery of Caves, an extensive complex of domed churches and museums founded by monks in 1051. Its Ukrainian name, Pechersk, comes from the underground passages and chapels that have been dug into the rocks alongside it. After lunch, spend some time exploring Kiev on your own, perhaps strolling the city center’s broad Kreshchatik avenue, lined with inviting shops and chestnut trees. Visit the fascinating Pirogovo Folk Museum today, a remarkable collection of more than 200 wooden structures relocated and rebuilt here from regions throughout Ukraine. Each building reflects a particular region, style and historical period of the country’s past and is brought to life by exhibits of folk costumes, musical instruments and household articles. You may spend the remainder of the day on your own or take an optional Jewish Kiev tour. Dinner aboard is followed by evening sailing along the peaceful Dnieper River, past gently rolling hills, forests and quaint villages. After breakfast, enjoy a city tour of Kremenchug. With its riverside location along the trade route between the 16th-century duchy of Muscovy (today’s Moscow) and the Black Sea, this town grew into a wealthy Cossack center. You will be welcomed today into the home of a local family for snacks. Your enriching visit will shine a light on the daily lives of Ukrainians and you’ll come to embrace both your differences and your similarities. 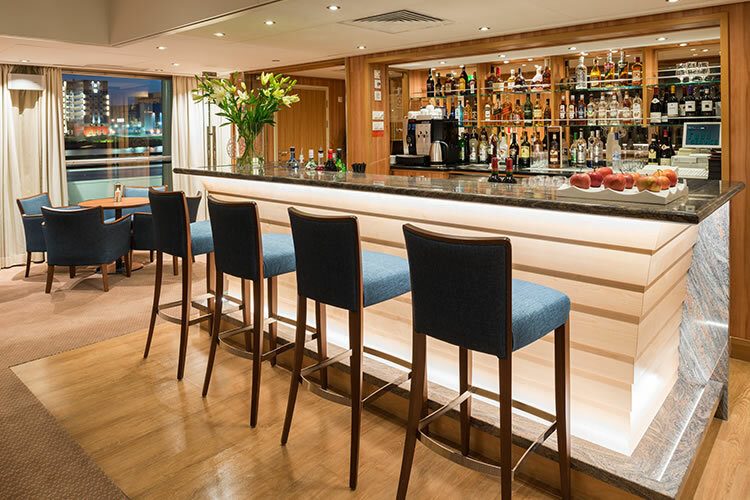 You can share your experiences and impressions this evening during our on board dinner. Undulating hills, vast open landscapes and a bend in the rambling river lead to Dnepropetrovsk, a former fortress settlement. The city was founded by Catherine the Great’s lover as a summer residence for the tsarina. During a city tour, you will see the long boulevards, green parks and provincial public buildings. Stop to browse the Petrykivka Folk Art Center, founded by the celebrated Cossack known as Petryk. This settlement is famed for its rich ornamental style of decorative floral painting that embodies the culture’s connection to the natural world. After breakfast, tour Zaporozhye, ancestral home of the Cossacks. Drive along Lenin Street; see the Lenin Monument, dam and the city’s massive hydroelectric plant. Then visit the Cossack Museum of Khortitsa. Enjoy a special Cossack horsemanship show full of spectacular acrobatics accompanied by folkloric music and dance. During lunch aboard, continue sailing down the Dnieper; this afternoon, enjoy scenic cruising and on board activities, including a Ukrainian tea party. Cruise through the night. Enjoy a morning of scenic cruising through a rich, fertile landscape of corn and watermelon fields. After an on board Ukraine history lecture, arrive in Kherson mid-afternoon. Disembark for a tour of this small city, founded in 1778 by order of Catherine the Great and named after the nearby ancient Greek colony of Chersonesos Taurica. Walk along the river embankment, see the monument to Prince Potemkin and visit St. Catherine’s Cathedral, decidedly Mediterranean in design. You will also visit the local craft market, where you’ll find colorful fabric, nesting dolls and decorative housewares. Dinner is served as we depart and make our way into the wide-open waters of the Black Sea. After breakfast, enjoy a half-day city tour of Odessa, an elegant city of terraced hills and landscaped parks. Travel along Primorski Boulevard to the Italian-baroque Opera House and to Potemkin Steps, where one of the most famous scenes in cinema was shot by Sergei Eisenstein for his 1925 classic, The Battleship Potemkin. After dinner, you may choose to attend an optional performance at the Odessa Opera House, known for its splendid acoustics. Begin today with a tour of Akkerman Fortress of Bilgorod–Dnistrovski, a mighty and imposing citadel dramatically overlooking the Black Sea. It is the largest and best preserved fortress in Ukraine. Later, spend more time exploring Odessa’s stately 19th-century architecture, a blend of its Russian heritage and Mediterranean sensibilities, or stroll along its miles of sandy beaches. Or you might join an afternoon optional excursion to the Odessa Opera House, where you can see a special performance in the oldest theater in the city. After breakfast, tour the fascinating Odessa Catacombs. This maze of underground tunnels began as a sandstone mining operation but the abandoned mines were later used by smugglers and Soviet partisans fighting fascist invaders during the Second World War. Or visit the Odessa Art Museum in Potocki Palace, a treasure of 19th-century architecture and colorful, eclectic interiors. During your visit, browse a rich collection of Russian and European paintings, sculptures and decorative arts spanning centuries. This afternoon, enjoy free time discovering more of this remarkable city, perhaps visiting the Uspensky Cathedral, a vision of blue and white domes, or joining an optional excursion to Odessa, where you’ll tour historic synagogues and monuments of Jewish heritage and significance. After breakfast, disembark and proceed to the airport for your return flight.